About a dozen people attended the Shirlington Community Canine Area (CCA) meeting at the Shirlington library May 18. On the agenda was setting a date for the next clean-up day, the cost of waste pickup bags, County maintenance and rule changes. The most surprising announcement was that the County is going to ban children under age eight from being in the park. They are also going to require that children ages 8-14 be accompanied by an adult. Keith Fred, head of the Shirlington Dogs sponsoring group that voluntarily manages the park, said the County has made the decision already, and they are just waiting for a final review by the County’s lawyers before they post the new rule at the park. He said that the County researched the rules of other dog parks in the local area and consulted with legal counsel in order to develop the ban. However, dog park users were not informed that the rule was under consideration, and no public notice was posted to invite community input prior to the County making the decision. It is true that Fairfax County bans children under eight years old from their seven dog parks. Fairfax County dog park rules. Alexandria, however, only requires that children under 16 years old be accompanied by an adult in their 18 dog parks. Alexandria dog park rules. As a childless dog owner who goes to the Shirlington CCA multiple times a week, I think it would be a shame to ban children. Requiring that all children be accompanied by an adult is reasonable. Denying families who can’t afford a single family home with a yard—which in this high-priced housing market is a huge number of Arlington residents—the opportunity to enjoy off-leash time with their dog is, in my opinion, wrong. Anyone wishing to express their opinion on the issue can contact the Arlington County Parks and Natural Resources Department through their online Contact Us form or at 703-228-6523 or 6525. Fred also shared interesting statistics about the CCA. 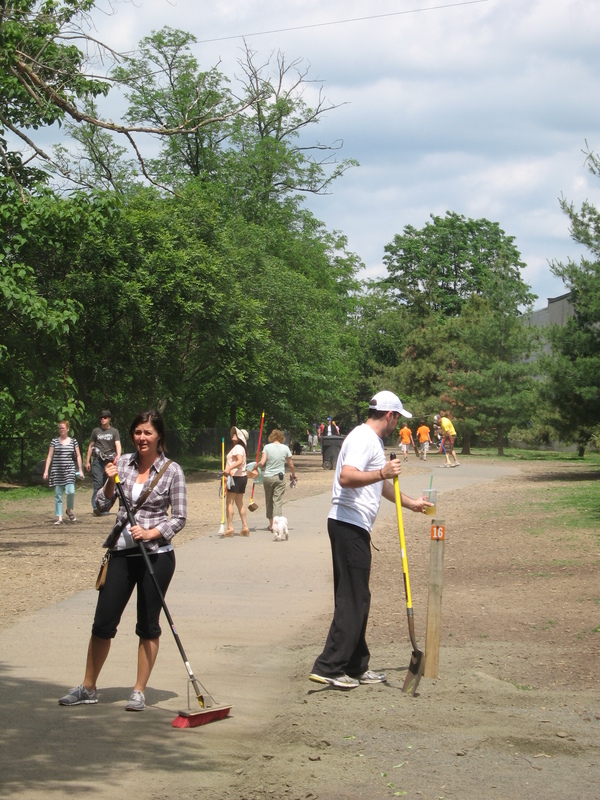 He estimates, and Arlington County concurs, that the park has more than 5,000 users A WEEK. That is higher than any other Arlington County dog park, and possibly more than all other Arlington County dog parks combined. That many dogs means a lot of dog waste. More than 2,500 pickup bags are used each week—that’s 120,000 a year. The Washington Post used to donate bags to the park, but stopped a few years ago. Arlington County does not pay for the bags, which cost $3,000 a year. They are partially paid for by donations, but Fred uses his own money to pay for the majority of them. Volunteers working during the Shirlington CCA's last clean up day. There will be a donation drive in conjunction with the next CCA clean up day, which was set for Saturday, June 18 from 10:00 a.m. to 12:00 p.m. Clean up volunteers are asked to bring work gloves and tools such as shovels and rakes. Water will be provided for the volunteers. Fred asked that park users make sure their dogs do not approach County workers while they are maintaining the park, as the workers have complained. He also reminded users that the park closes 30 minutes after sunset, and said that park rangers patrol after hours and will cite violators. Finally, Fred thanked the Arlington County Fire Department at the South Walter Reed station for voluntarily flushing the drainpipe near the small dog play area that had been backing up and causing a large puddle of standing water. How many of those 5,000 users a week are children under 8 accompanied by an adult? I guess he did not have that statistic. I cannot imagine that a child would not be with their family. Did he present any reasons or statistics about unaccompanied children at the park that led to this internal and undemocratic decision? Are they concerned about bite prevention? Simply solved: teach Mom and Dad, the basics of canine body language and how to approach an unfamiliar dog safely. Parents, then, teach their children. And paying for poop-bags out of his own pocket should be a last resort. Fundraising is a good idea. They should organize a Family Day at The Shirlington Dog Park – a good way to teach children to respect the environment and the importance of scooping poop! I forgot – the park is Family Unfriendly! I urge all concerned dog park users to contact Caroline Temmermand, Division Chief, Parks and Natural Resources Division. Arlington County does not make it easy to express your concerns via email, but I did find a direct link to an email form here: http://www.arlingtonva.us/web/contact.aspx. Or you can call 703-228-6523 or 6525. What an arbitrary rule. Like the age of a child even matters. There are full-grown adults that can’t handle being around dogs, let alone an eight year old. Now I will have to hire a baby-sitter for my son…so that I can take my dogs to the park!!! It is a dog park, correct? Wouldn’t that imply that all parties, regardless of age, gender, breed (or whatever other arbitrary metric the county feels like throwing in), all know that there will be dogs in a dog park? And as such, plan accordingly? It’s not like families are haphazardly throwing infant babies into the lion’s cage at the zoo. Can’t they just post some ridiculous sign stating the obvious, like the “caution: contents hot” warnings on a McDonald’s coffee cup? This rule will make no difference. People don’t follow several of the rules already. 3+ dogs, pick-up after your dog, keep an eye on your dog, NO aggressive dogs……the list goes on. Personally, I would never let my kid walk around a park full of strange dog but I guess some feel differently. I have seen just about everything in the past 5 years and that includes small children being trampled by dogs playing. Heck, I know I guy who had his finger amputated from a dog bite. If Arlington want to do the dog community some good, they should enforce the rules they already have so nobody gets hurts and everyone can enjoy themselves without worrying about someone child or mis-behaved dog. And please do something about that awful blue tarp already!!! This rue of not allowing children will probably see a lot of angered patrons of the park. I go to the park every day after work with my two dogs. Binky and Canyon. I always see moms on walks with their children in strollers. I have seen numerous grandparents taking their grand children to the park to meet the doggies as well. I understand the safety concerns here, as dogs move very fast, are not always aware of their surroundings, and are often larger than little kids, but banning children is a bit over kill. Many people will be restricted from going to the park. Many more children will be left out of the fun of playing with dogs, and learning about them. My big dog will always walk up to a stroller for a gentle sniff and snuggle of the little ones, and the little ones always enjoy, and I have yet to have a mother or father be offended, scared, or worried for their children’s safety in the park. My little dog loves to play with kids, and they like her vry much as well because she is just their size. I am all for requiring kids to be supervised by adults, and posting the rules everywhere in the park. I feel this is a knee jerk reaction to what other dog parks do. I hope that there can be a middle ground met here, but I foresee this being approved with or without our consent. One other question… How will they enforce this? Will Arlington have the park service monitor the park and give citations to people who are unaware of these rule changes? No specific reason other than “other parks do it” was given, and no data such as number of complaints or children hurt was provided. Mr. Fred did say that nothing was posted about the proposed rule change so that the public could comment. He said the County employee in charge of the dog parks is Caroline Temmermand, I encourage everyone to reach out to her with your opinions at (703)228-6523 or 6525. This is a very unfortunate decision. I live in the Kingstowne / Springfield area and travel all the way to Shirlington just for the use of the dog park. I often go during weekday afternoons with my older dog and my two kids. It is quiet at that time with fewer dogs and less commotion. The kids understand that this is the dogs’ park and just as the dog has to be leashed at playgrounds, they need to be holding a hand or in a stroller at the dog park. Both rules are for safety and hygene of the kids. I strongly agree with the post suggesting that signs making it perfectly clear that users accept the risks of entering the park. With the cost of babysitting in the area at $15 per hour for two kids, the dog park will be a luxury that our family will no longer be enjoying. It is very unfortunate for our dog and her social needs as well as for my children who enjoy learning about the breeds and the body language of the dogs. I go out of my way to come to Shirlington because the community at the park is welcoming and close knit. I’m sorry to be losing that. I posted about the rule change because I thought it probably would not be met with indifference. Hopefully if enough people make their concerns known, Arlington County will listen. Please let them know your concerns at 703-228-6523 or 6525. I live in St. Louis and this has been the rule since the dog park near my house opened. I absolutely hate it and the reason is all about liability, like people can be trusted to be responsible for their dogs, but not their kids. When we first joined, we had one dog and no kids. We went to the dog park 4-6 times a week with our active border collie, who could not get enough of running around with his pals. When I had my first child, we had to stop going and then dropped our membership altogether because I was the primary dog & kid caregiver, and my kid wasn’t welcome at the park. My community is a city neighborhood where the lots are about .08 acres, so you can imagine how much space my dogs have to run around. It is a shame, and I’m sorry to see more dog parks instituting this ridiculous rule.